The Silver Globe was one of the most critically acclaimed albums of 2014, including the coveted Piccadilly Records album of the year. We missed it around the time of the launch, but this timely reissue of the album after a series of celebratory live shows with an additional disc of material is an appropriate time to revisit it. 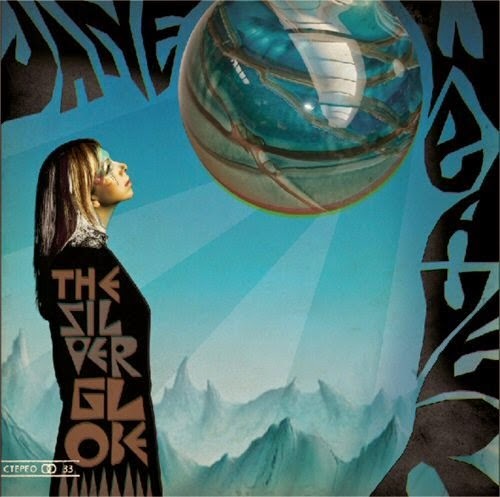 Album six is an unusual time for any artist to receive a surge of acclaim, but that's what has happened to Jane Weaver with the release of The Silver Globe last year. The album deserves everything that's come its way as well, combining pulsating thrusting electronic beats with an angelic otherworldly voice that feels somehow disconnected from what is going on around it, but also in perfect tandem with the atmosphere and mood that's been created. It's a theme that continues throughout, starting with the eight minute Argent. It focuses around sections where Jane's voice soars to accentuate the words she's singing, but also diverts away on instrumental tangents. In a similar vein is the wonderful single Don't Take My Soul. There's dancefloor elements underpinning that and Mission Desire where Jane moves from one vocal style to the next as effortlessly you'd move from one sentence to the next in conversation. Arrows' beauty in its simplicity in the way Jane's voice surrounds you in a warm glow that so few singers can achieve. These aren't just songs, they're artistic statements, creating sounds that convey emotions, lift the listener out of the ordinary world into a dreamscape. Cells for example is so fragile and beautiful you feel it could crack at any point as Jane sings "air flowed past me like the sound of an orchestra as if I were one of those birds that flew into the sun." Equally emotional is Stealing Gold, the closest on the record to the more folk stylings of her recent albums, but as the acoustic guitar slows and fades at the end it leaves the listener with a feeling that they've lived through the emotional whirlwind of the song. The Silver Globe is a singularly uplifting album that is equally at home on a dark night in a dimly lit room as it would be in a soundtrack for a wilfully eccentric movie or in one of those obscure dance clubs where the DJs spin the most magnificent records that you've never heard before. It takes a few listens to fully immerse yourself in its beauty, but like all great records it's more than a worthwhile investment. It's now been augmented (on CD or download if you buy the new silver vinyl version of The Silver Globe) by an accompanying piece entitled The Amber Light, which features ten tracks including three reworks of tracks from the album (Argent, The Electric Mountain) and a PJ Philipson version of Your Time In This Life Is Just Temporary and seven previously unreleased tracks. The Argent and Your Time reworks retain lots of the original whilst taking a slightly different approach to the track and Andy Votel's Analogue Mountain Instro does what all good remixes should and retain the link between the remix and the original, but adding something to it. Of the unreleased tracks the songs don't change too much in intent from the original album without being in any way a set of cast offs from that record. La Pomme D'Argent is a brooding instrumental, but the real standout track is the eight minute I Need A Connection, a repetitive punching beat Jane pleading "I'm standing on the edge of you, I need a connection" and "I want to protect you, I want to suggest you." The listener is drawn in by the mood created by the music and the voice and the subsequent You Are Dissolving, with more of a traditional song structure, is no less seductive. The title track is a beautifully slow understated piece that allows the beauty of Jane's voice to shine as she lingers on notes accentuating the softer elements of it. Cascade In Dark is ever more minimalist, a soft slow piano accompanied by Jane singing both lead vocal and drifting evocative backing harmonies. Similarly tender and exquisite is Parade Of Blood Red Sorrows from the film Kiss Of The Damned, subtle slightly haunting wordless vocals dancing over a melancholic atmospheric backdrop. Closing track Neotantrik Globes feels like an experimental piece of music more than a song and sits a little uncomfortably along some of the other tracks. The Amber Light is an excellent accompaniment to The Silver Globe. It includes a couple of tracks that could have made the original album (Jane did tell us that I Need A Connection was a new song at a recent show), some that retain the high standards of the album but don't necessarily fit the mood and some interesting reworks of tracks from it.